Even a fashion rebel who changes her look constantly can revisit "classic" or "vintage" looks. That's just what happened with Rihanna's red-haired Vanity Fair cover. It's a throwback to Rihanna's look on her April 2011 Vogue cover. Nearly five years have elapsed between these covers, so of course Rihanna made a few tweaks to the current presentation to avoid being an exact copy of herself. The web is currently abuzz about the singer deeming Rachel Dolezal a "hero" in the accompanying feature. But from a strictly fashion and beauty perspective, this November 2015 cover marks a familiar look and one that worked for Rihanna, since pairing a bold, loud hair color with a feminine dress is always a style "do." There's nothing wrong with recycling in fashion, even when you are a trendsetting rulebreaker like Rihanna. This is not a step back for her. Let's compare and contrast the cover makeup and clothes and travel back in time to 2011 while we're doing it! Both the Vanity Fair and Vogue covers feature Rihanna rocking a thick and lush cascade of fire engine red waves. She also matches her flame-hued hair to her lipstick; it's a statement-making approach. Rihanna also displays some front side cleavage on both covers, thanks to the deep V of each outfit's bodice. Those are the obvious similarities. What's less obvious? 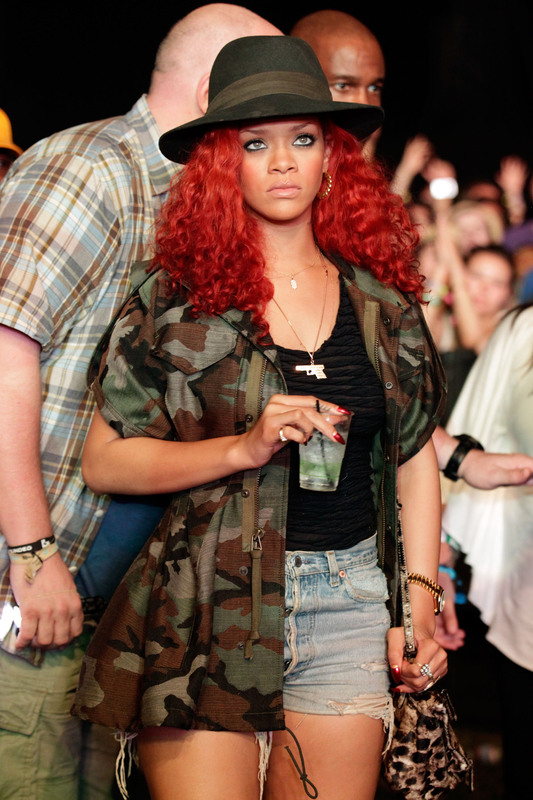 The fact that Rihanna isn't smiling, instead opting for an oh-so-serious pout. Her stare is intense in both shots, even if one eye is obscured by a thick wave on the Vogue cover. Notice that the singer is also posing from the side and slightly bent over on each cover. Her arms are even perched the same way. For Vanity Fair, she's leaning against a classic car. For Vogue, she's clinging to a glass partition. So these covers are a lot more similar than a shock of bright red hair and crimson lips. But how are they different? Well, for one, RiRi is wearing a mint-colored, retro romper for Vanity Fair, showing lots of leg. For Vogue, she poured her frame into a silvery, long-sleeved, semi-naked, and sleek gown that showed skin while covering it up at the same time. It was a sparkly fashion optical illusion! All in all, Rihanna's Vanity Fair and Vogue covers are more similar than they are different. Could this mean that Rihanna will eventually commit to a signature look, since her current signature seems to be changing as often as possible to avoid boredom with a singular look? That's a distinct possibility!